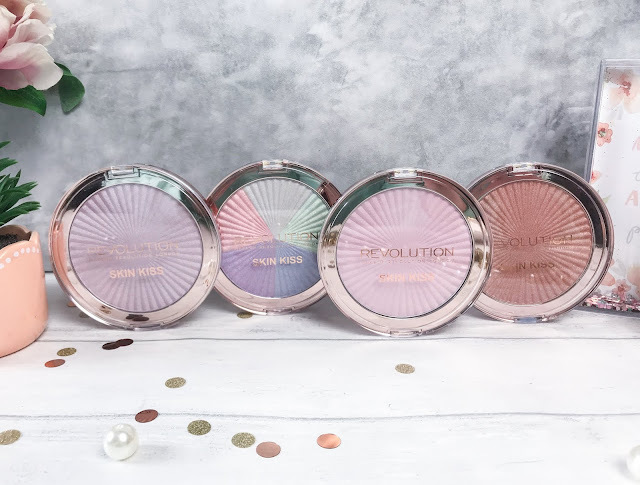 Another amazing release from Revolution are the Skin Kiss highlighters, which are available in ten different shades, and are definitely worth the money! It is so hard to choose just one, and I ended up ordering four shades, which when they arrived surprised me due to the size of them - I expected a regular highlighter-sized pan, but the Revolution Skin Kiss Highlighters are in much larger, bronzer-style compacts, so you are going to be able to get a lot of use out of them. 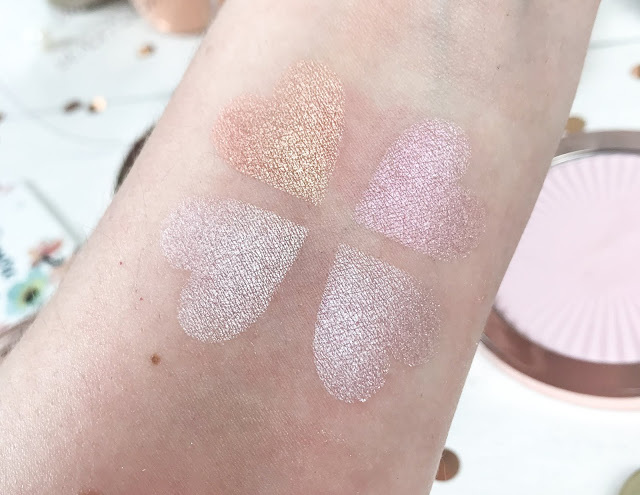 The first of the four I picked up was Dream Kiss, which looks so pretty in the pan alone, and consists of five amazing intense shades, including white, mint green, baby blue, lilac and baby pink, which can be used alone or swirled all together. Each section contains iridescent shimmer to give the face and body the perfect glow and highlighter. Peach Kiss is a warm-toned peach shade with a slightly bronze effect to it, which looks beautiful in Summer with a tan, or on warmer skin tones, but I also think it makes a stunning eyeshadow shade. The Skin Kiss formula is buttery soft and as they are so pigmented, applies to the skin easily with just one sweep of the brush. Pink Kiss is a very light, almost lilac-tinted shade, with an icy effect to it. If you are wanting full on highlight, then this is the one for you as it adds such a gleam to the skin. Not that you would necessarily need it with this shade, but if you want to make highlighters even more pigmented, simply spray your brush with a little setting spray or primer spray before swirling it into the pan. Prismatic Kiss is an iridescent pink and lilac highlighter shade that provides the skin with a stunning radiant luminosity. This is possibly my favourite out of the four as it reminds me of Urban Decay’s Aura Highlighter which is one of my all-time favourites as it adds the prettiest prismatic pink shade to the skin without being too over the top, for an everyday glow. 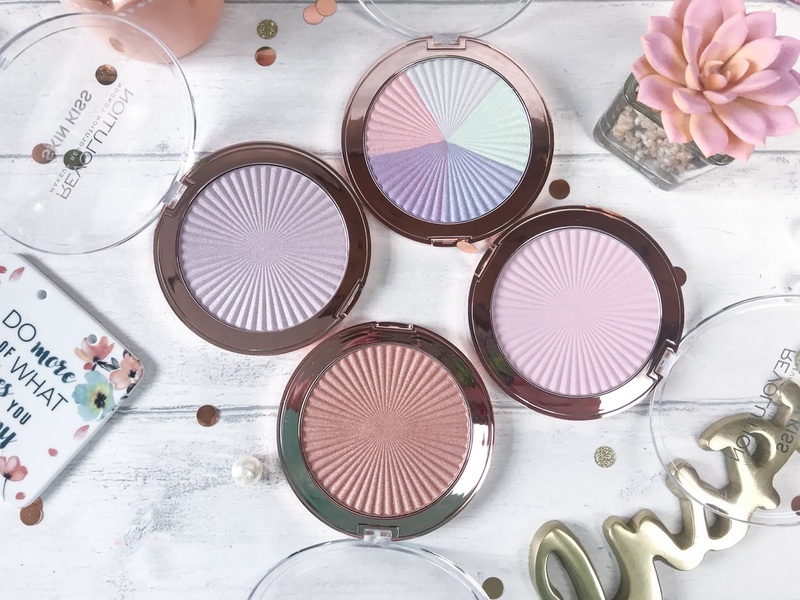 Each Skin Kiss Highlighter costs just £5, which is amazing value and they are available online at Revolution.